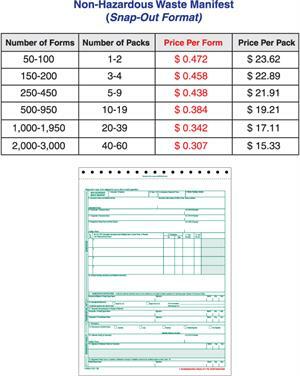 Sold in packages of 50 forms. Enter number of packages below. This a Non-Hazardous Waste Manifest form. It is a six part form made with premium carbonless paper. This snap-out version of the form can be filled out with a typewriter or by hand. They are sold in packages of 50 forms. They have the same fields and print positions as the 6-part EPA Uniform Hazardous Waste Manifest Form 8700-22 (Rev. 3-05) and new 5-part EPA Uniform Hazardous Waste Manifest Form 8700/22 (Rev. 12-17). The Non-Hazardous Waste Manifest form is not regulated by the EPA and its use is not allowed in all states. You must check with your state regulatory agencies to verify that this form is appropriate for shipments of non-hazardous waste in your state. 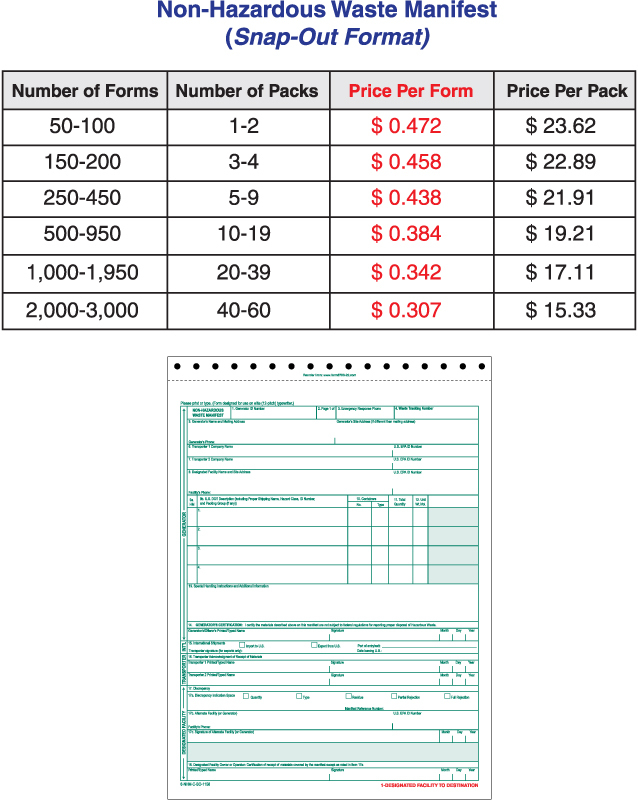 We can number these forms with a numbering series that you specify. Please contact us if you would like to have these forms numbered. We can imprint your company name, address and other information on your forms. Please click here for more information on imprinted forms.